The finale of the fourth season of CBC's Battle of the Blades is Sunday night, November 17, 2013. The popular show premiered two months ago after a two-year hiaturs, and features eight couples competing at the MasterCard Centre in Etobicoke, Ontario. The couples are comprised of former NHL hockey players paired with female figure skating professionals. Ron MacLean is the show's host, and the judges include Kurt Browning, Jamie Sale and P.J. Stock. In addition to voting by the judges, viewer voting is done online (telephone and texting were eliminated this season). Each unregistered visitor gets one vote, while registered visitors may earn additional votes by filling out a profile and participating in other activities on the website. If you're headed to Vancouver, BC this holiday season -- pack your ice skates. 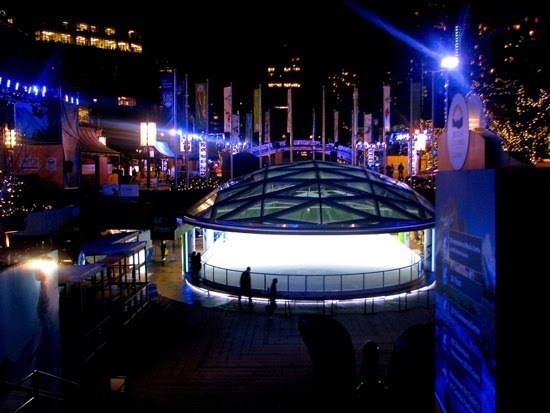 The Robson Square Ice Rink opened on November 15, 2013 and will run through February 28, 2014.